We offer facts and context as a national gun-control debate intensifies. The mass shooting in Newtown, Conn., has reignited a national debate on gun control. As elected leaders begin the dialogue, some facts are clear — there has been a massive increase in gun sales. Some things are not so clear — such as whether there is causation between more guns and more violent crimes. And some are contrary to the general impression — for example, the rate of gun murders is down, not up. We have decided to look at some of the rhetoric and how it squares with the facts, while offering some broader context to inform the debate. Rep. Louie Gohmert said that “every time … conceal-carry [gun laws] have been allowed the crime rate has gone down.” But that is far from a settled issue in academia. Dan Gross, head of the Brady Campaign used the number of daily gun murders as proof that “gun violence rates are not” going down. But the rate of gun murder is at its lowest point since at least 1981: 3.6 per 100,000 people in 2010. The high point was 7 in 1993. However, non-fatal gun injuries from assaults increased last year for the third straight year, and that rate is the highest since 2008. Federal data also show violent crimes committed with guns — including murders, aggravated assaults and robberies — have declined for three straight years. Rep. Donna Edwards said that “since Columbine, there have been 181 of these school shootings.” That’s an inflated figure. She used a list of “major school shootings” supplied by the Brady Campaign that included incidents that were neither shootings nor at schools. By our count, the list shows 130 school shootings since Columbine that resulted in at least one student or school official being killed or injured — still unacceptably high, but about a quarter fewer than claimed. Here are some other facts. The United States has the highest rate of gun ownership in the world — by far. And it has the highest rate of homicides among advanced countries. And yet, gun crime has been declining in the U.S. Firearm murders are down, as is overall gun violence — even as gun ownership increases. Read our Analysis for more insight on what these statistics mean. On Dec. 14, on the afternoon of the mass shooting at Sandy Hook Elementary School in Newtown, Conn., and after a spate of public mass shootings, President Obama said that “we’re going to have to come together and take meaningful action to prevent more tragedies like this, regardless of the politics.” He didn’t say “gun control,” but there was little doubt that’s what he meant. On cable news and other media outlets, gun rights advocates have begun to push back. Both sides offer statistics that appear to back their arguments, and so we have attempted to add some factual accuracy to the debate. Do Concealed-Carry Laws Reduce Violent Crime? Few gun rights advocates in Congress initially were willing to speak publicly in the wake of the mass shootings in Newtown, but Republican Rep. Louie Gohmert of Texas bucked that trend on Fox News, providing an against-the-tide opinion that the answer to tragedies like that was not fewer guns, but more guns. Had the principal been armed, he said, she might have killed shooter Adam Lanza before the rampage developed. Gohmert, Dec. 16: Hearing the heroic stories of the principal, lunging, trying to protect … I wish to God she had had an M-4 in her office, locked up so when she heard gunfire, she pulls it out and she didn’t have to lunge heroically with nothing in her hands, but she takes him out, takes his head off before he can kill those precious kids. While some politicians talked about the need for tighter gun control, Gohmert argued that violence is lower in places more permissive of concealed weapons. Gohmert, Dec. 16: The facts are that every time guns have been allowed — conceal-carry (gun laws) have been allowed — the crime rate has gone down. We read a bit of the large body of academic research on the issue and spoke to some of the leading academic voices about the accuracy of Gohmert’s claim. “The answer is, the Congressman is factually correct,” said Carlisle Moody, economics professor at William & Mary. “That [Gohmert’s comment] is just completely wrong,” said David Hemenway, director of the Harvard Injury Control Research Center. Suffice to say there is academic disagreement on this issue. Crime is down dramatically right now — even in states that have not passed such laws. To prove causation, which Gohmert’s statement implies, would require that those doing the study discern what would have happened if not for the law, and that is almost impossible to model. According to Gohmert’s office, the congressman bases his claim largely on the controversial and hotly contested research of economist John Lott. In the most recent 2010 edition of Lott’s book, “More Guns Less Crime,” Lott concludes that “[a]llowing citizens to carry concealed handguns reduces violent crimes, and the reductions coincide very closely with the number of concealed-handgun permits issued.” (p. 20) Lott writes that the result of his research “clearly imply that nondiscretionary [concealed carry] laws coincide with fewer murders, aggravated assaults, and rapes” (p. 57). He contends that “[w]hen state concealed-handgun laws went into effect in a county, murders fell by about 8 percent, rapes fell by 5 percent, and aggravated assaults fell by 7 percent” (p. 59). While Lott’s work is often cited by gun rights advocates, his findings are strongly disputed by numerous academics. Most notably, in 2004 a committee of the National Research Council of the National Academies analyzed Lott’s research and took issue with his findings, concluding that “it is impossible to draw strong conclusions from the existing literature on the causal impact of these laws” (See Chapter 6). National Research Council, 2004: The initial model specification, when extended to new data, does not show evidence that passage of right-to-carry laws reduces crime. The estimated effects are highly sensitive to seemingly minor changes in the model specification and control variables. No link between right-to-carry laws and changes in crime is apparent in the raw data, even in the initial sample; it is only once numerous covariates are included that the negative results in the early data emerge. While the trend models show a reduction in the crime growth rate following the adoption of right-to-carry laws, these trend reductions occur long after law adoption, casting serious doubt on the proposition that the trend models estimated in the literature reflect effects of the law change. Finally, some of the point estimates are imprecise. Thus, the committee concludes that with the current evidence it is not possible to determine that there is a causal link between the passage of right-to-carry laws and crime rates. Lott adamantly defended his conclusions in a phone interview with FactCheck.org, and noted that there was one notable dissenter from 17 others on the committee, the late James Q. Wilson. Wilson argued (Appendix A) that he found Lott’s analysis supported the conclusion that concealed-carry laws reduced the murder rate. Donohue and Ayres, 2003: We conclude that Lott and Mustard have made an important scholarly contribution in establishing that these laws have not led to the massive bloodbath of death and injury that some of their opponents feared. On the other hand, we find that the statistical evidence that these laws have reduced crime is limited, sporadic, and extraordinarily fragile. … [T]heir results have not withstood the test of time. When we added five years of county data and seven years of state data, allowing us to test an additional fourteen jurisdictions that adopted shall-issue laws, the previous Lott and Mustard findings proved not to be robust. Importantly, we showed that the Lott and Mustard results collapse when the more complete county data is subjected to less-constrained jurisdiction-specific specifications or when the more-complete state data is tweaked in plausible ways. No longer can any plausible case be made on statistical grounds that shall-issue laws are likely to reduce crime for all or even most states. Indeed, a cottage industry of sorts has emerged to debate the issue. Some have found some benefit to concealed-carry laws, and other no benefit at all. Gohmert’s comment — that “every time … conceal-carry (gun laws) have been allowed, the crime rate has gone down” — is somewhat a matter of semantics, said Moody, at William & Mary. In fact, crime is down in states that have not passed concealed-carry laws. The impact of such legislation is debatable. There are two reasons why the effects of CCW laws on crime are likely to be negligible, the authors wrote. First, only a tiny percentage of the population seeks to obtain a concealed weapon permit. And those who do tend to be from groups who are at relatively low risk for either crime perpetration or victimization. They are generally older, higher-income, rural whites. The second is that more concealed guns mean more disputes resolved with guns, and that it leads to more violent crime. Susan B. Sorenson, a professor of Social Policy at the University of Pennsylvania, is convinced the Lott data is weak (for example, she said, if you take the outlier Florida out of the mix, the results change remarkably). But more important, she said, is that there is simply a dearth of good data. “We really don’t have answers to a lot of the questions that we should have answers to,” Sorenson. In part, she said, that’s because the gold standard for scientists — a randomly assigned study in which you gave one group of people guns, and another none — is simply not possible. There is work the Centers for Disease Control and Prevention could and should be doing, she said, but has not since the late 1990s. CDC has been wary of studying gun issues after NRA lobbyists convinced Congress to cut into its funding after a series of studies in the mid-1990s were viewed by the NRA as advocating for gun control. What kind of study is CDC not doing? “The kind of information we need at the policy-making tables,” Sorenson said. The bottom line on Gohmert’s statement is that the issue is much too unsettled for such a definitive claim. There is, of course, a larger implication to Gohmert’s statement: that more guns equals less crime. That is a different issue than simply concealed weapons laws. In 2008, we explored the issue of whether more gun ownership meant more or less gun violence. What we found, and it still holds true, was that some studies had shown a statistical relationship between those factors — areas with a higher prevalence of guns had higher prevalence of gun homicides and homicides in general. But studies haven’t been able to show a causal relationship — that the mere presence of guns, as opposed to other factors, caused the higher rates of gun violence. It’s doubtful, however, that a study could ever beyond-a-doubt prove a causal relationship. As Sorenson explained, scientists can’t conduct a random experiment. So, instead, researchers are left with statistical models, which are “very fragile,” says Charles F. Wellford, who was chair of the committees that authored a lengthy 2004 report on this topic by the National Research Council of the National Academies. These models are subject to what control variables researchers use. “Everyone knows there’s other things than guns that cause crime,” says Wellford, a professor in the Department of Criminology and Criminal Justice at the University of Maryland. So these models become very complex and slight changes can cause very different results, he says. The National Research Council review of the available research on guns and crime found that studies comparing similar geographic areas, such as urban areas to urban areas, known as “case-control studies,” showed that “violence is positively associated with firearms ownership.” But when looking at larger areas, such as countries, the National Research Council report found “contradictory evidence.” Both types of studies, said the report, failed to address factors involved in buying a gun — it’s not a random decision. And gun ownership data itself is lacking — it comes only from public opinion surveys. Hemenway, director of the Harvard Injury Control Research Center, says he would “bet a lot of money” that the prevalence of guns increases homicide, all other things being equal. “I think the evidence is very consistent with the notion that more guns have made us less safe.” But it’s “almost impossible” to prove a causal relationship. “All the data are consistent with a causal relationship, but it’s very hard to say anything is causal,” he says. There’s also a chicken-and-egg question when it comes to gun violence. Did the violence come first, and then the guns followed, or the other way around? A study by the Law Center to Prevent Gun Violence found that seven of the 10 states with the strongest gun laws — by its own definition — also had the lowest gun death rates. Of course, there’s a chicken-and-egg issue with gun control laws, too — it’s easier to pass gun control laws in areas that already had low gun ownership, and harder to pass them in areas with more gun owners. In all cases of injury prevention, says Hemenway, the agent, or method, involved makes a difference. On Dec. 14, the day of the shooting in Newtown, another attack occurred at an elementary school in China. The attacker there had a knife, and injured 22 kids and one adult. But no one was killed. Why the stark difference in fatalities? “The answer is the type of weapon they had,” Hemenway says. The NRC report, like Sorenson, said that more research was needed. “The federal government has to invest some money in doing research on what role guns play in violence,” Wellford says. When we spoke with Wellford in 2008, he cautioned against drawing conclusions from statistics that didn’t prove causation. “Work that knowingly reports findings that do not meet a causal test knowing they will be used as if they do can only produce confusion especially in such contentious issues,” he said. Moody, of William & Mary, makes a more general argument in favor of more guns tempering crime. It’s true that gun ownership is up. The Small Arms Survey, a project of the Graduate Institute of International and Development Studies in Geneva, estimated in 2007 that there were 270 million civilian-owned firearms in the U.S. In 2001, there were an estimated 230 million. So there are more guns, but are there more gun owners? Nobody knows for sure, Hemenway said. Gun owners do not need to register simply to purchase a gun. And so, researchers are left to rely on surveys. According to yearly data from the General Social Survey, the number of households with guns is declining. Moody doesn’t buy that. He thinks it’s a cultural issue. People today are simply more likely to tell survey-takers they do not own a gun, he said, because it is less socially acceptable. Hemenway counters that the seemingly incongruous statistics — more guns, but fewer households reporting that they have a gun — is simply a reflection of fewer gun owners purchasing more guns. Gun manufacturing has increased in recent years, most dramatically since Obama was elected. Figures from the Bureau of Alcohol, Tobacco, Firearms and Explosives show the total firearms produced in the U.S. (minus exports) at 3.5 million in 1998. That figure fluctuated, reaching 3.7 million in 2007. Then, it jumped drastically, rising 64 percent from 2007 to 2011, topping 6.1 million that year. Background-check numbers show a similar trend. They went from 11 million background checks in 2007 to 16.8 million in 2012, with December’s numbers not yet part of that tally, according to the FBI. Background checks are not an indication of sales, however, as they’re not always required, for instance for personal sales at gun shows in some states, and one purchaser can buy more than one firearm. On “Face the Nation” on Dec. 16, Dan Gross, president of the Brady Campaign, used the number of daily gun murders as proof that “gun violence rates are not” going down. But the rate of firearm homicides committed with the intent to kill or injure is at its lowest point since at least 1981: 3.6 per 100,000 people in 2010. The high point was 7 in 1993. Gross, Dec. 16: … every day in our country, 32 people are murdered by guns. So while violence rates might be going down, gun violence rates are not. There are two issues here: gun violence in general and gun murders in particular. Let’s first look at the number of murders committed with guns. We called and emailed the Brady Campaign to ask about Gross’ statement on gun violence but we did not receive a response. The CDC’s most current data show there were 11,078 homicides committed with guns in 2010 — or about 30 per day. The CDC data also show gun homicides have declined each year since 2007, falling from 12,791 in 2006 to 11,078 in 2010, even as the nation’s population grows. In fact, the homicide rate in 2010 (3.6 per 100,000 people) was the lowest since at least 1981 — which is as far back as the CDC’s online database goes. Even so, the CDC homicide data is not a perfect measurement of murders in the U.S., which suggests the number of gun murders is somewhere between 24 and 30 per day. CDC homicide data, by its definition, is supposed to include only “injuries inflicted by another person with intent to injure or kill.” But Catherine Barber, at the Harvard School of Public Health’s Injury Control Research Center, said some local coroners and medical examiners “take a more literal definition of homicide,” so some accidental shootings are included in the CDC data. Also, the CDC data, by definition, includes “justifiable homicides,” which also are not murders. Barber said the CDC’s reporting issues may overstate U.S. murder statistics by “a couple of hundred” — but its data are still “more reliable” than the FBI’s voluntary system of reporting. By either measure, the number of gun murders is going down. The 2011 and 2006 FBI crime reports show that firearm murders have declined each year since 2006. There were 10,177 such murders in 2006 and 8,583 in 2011 — a drop of 1,594 or nearly 16 percent in five years, even as the nation’s population continued to rise. As for overall gun violence, the FBI tracks the use of firearms in three types of violent crimes (murder, robbery and aggravated assault), and the use of guns has declined in all three cases. From 2006 to 2011, robberies committed with guns declined 21 percent and aggravated assaults committed with guns declined 12.5 percent, according to the FBI reports. In both cases, the number of violent gun crimes dropped each year since 2008. The number of reported gun injuries, however, is on the rise. There were 55,544 non-fatal injuries in 2011 resulting from assaults involving guns — up from 53,738 in 2010 and 44,466 in 2009, the CDC’s database shows. Since 2001, the rate of gun injuries is the second highest in 11 years when adjusted for population. However, Barber said gun violence has “dropped precipitously” from the early 1990s — a trend criminologists chalked up to “changes in the crack cocaine market.” Her observation is supported by crime data and surveys. As we said earlier, the homicide rate since 1981 peaked in 1993 at 7 per 100,000. In addition, the Census Bureau’s annual National Crime Victimization Survey collects data on nonfatal firearm-related violent crimes, including those not reported to police. That data set shows a dramatic decline in gun violence since the early 1990s. The Department of Justice, which commissions the Census Bureau’s victimization surveys, reports that there were more than 1 million firearm incidents and more than 1.2 million firearm victims in 1993 and again in 1994. 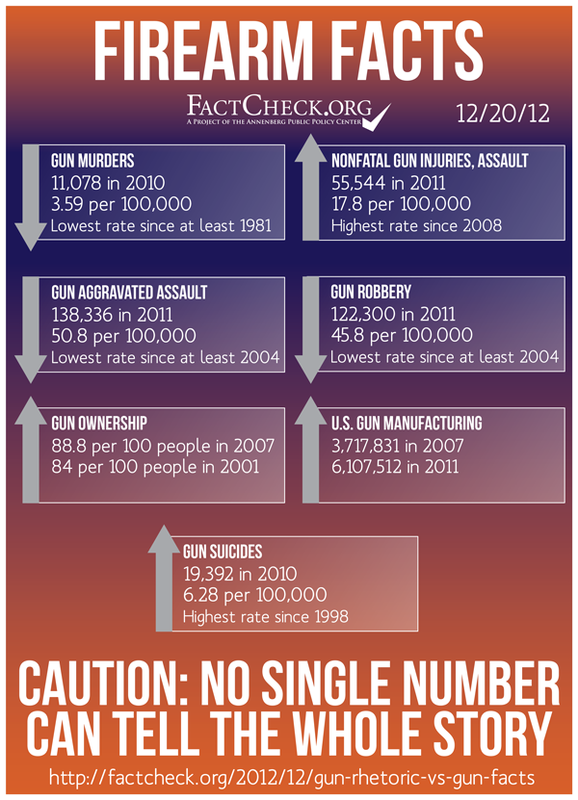 But by 2009, the number of firearm incidents (326,090) and firearm victims (352,810) dropped by more than two-thirds. 181 School Shootings Since Columbine? Rep. Donna Edwards on ABC’s “This Week” said “since Columbine, there have been 181 of these school shootings.” That’s an exaggeration. Her office said the Democratic congresswoman got her information from the Brady Campaign — which has a fact sheet on its website that lists 201 “major school shootings” since 1997 at colleges, universities, high schools and elementary schools. But that list is padded with incidents that could hardly be called “major school shootings” — including a dozen that didn’t happen on school grounds and 16 that weren’t shootings at all but either alleged plots to kill others or cases where a gun was brought to school but not fired. By our count, there were 62 school shootings since the Columbine High School massacre on April 20, 1999, that resulted in more than one student, teacher or school employee being killed or injured — a description that could fit “major school shooting.” There were another 68 where one student, teacher or school employee was killed (not counting suicides) or injured. That’s 130 school shootings since Columbine — a shocking high number, but about a quarter fewer than Edwards claimed. One problem in comparing various countries is the wealth of other factors, besides the mere presence of guns, that can affect whether a homicide occurs, such as the economy, general crime rates, and laws governing guns. Another issue is that the data isn’t all that great. Gun ownership numbers are largely based on public opinion surveys, and the reliability of numbers can vary widely from country to country. “We don’t have good data on the prevalence of ownership on all the countries we’d want to have it on,” says Wintemute. Janet Rosenbaum, an assistant professor of epidemiology at the School of Public Health at the State University of New York Downstate Medical Center School, told the Washington Post that “Switzerland has also been moving away from having widespread guns,” and moving away from having those in the army keep guns at home. The international data show that country-to-country comparisons are inherently difficult to make — and, as the NRC said, provide “contradictory evidence.” For instance, Latin American countries with high levels of firearm homicide show low levels of gun ownership. 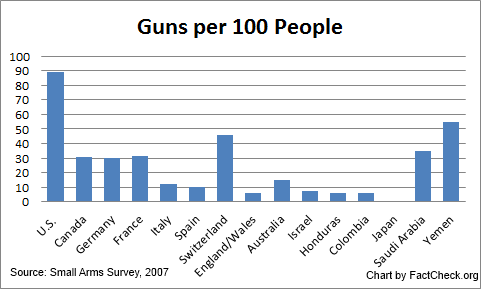 Honduras has a gun ownership rate of 6.2 per 100 people and a gun homicide rate of 68.43 per 100,000 people, and Colombia has a gun rate of 5.9 and firearm homicide rate of 27.09, as shown in this chart produced by the Washington Post using the same data we have cited here. Correction, Dec. 21: This article has been changed to say there have been 130 school shootings since Columbine that resulted in the death or injury of at least one student or school staffer — not including suicides — about a quarter fewer than claimed by Rep. Donna Edwards. The original story in some places contained a higher percentage and failed to note that the school shooting figures included those with gun injuries. Hepburn, Lisa M. and David Hemenway. “Firearm availability and homicide: A review of the literature.” Aggression and Violent Behavior. Vol. 9, 2004: 417-440. National Research Council of the National Academies, Committee on Law and Justice. “Firearms and Violence: A Critical Review.” The National Academies Press: Washington, D.C., 2004. Average civilian ownership data for 178 countries: Small Arms Survey 2007, Chapter 2, Annexe 4. UNODC Homicide Statistics. United Nations Office on Drugs and Crime. accessed 20 Dec 2012. Annual Firearms Manufacturers And Export Report. Bureau of Alcohol, Tobacco, Firearms and Explosives. Report years 1998-2011. Total NCIS Background Checks, Nov. 30, 1998 to Nov. 30, 2012. Federal Bureau of Investigations. accessed 20 Dec 2012. Hemenway, David. Director of the Harvard Injury Control Research Center. Phone interview with FactCheck.org. 18 Dec 2012. Wellford, Charles F. Professor, University of Maryland Department of Criminology and Criminal Justice. Phone interview with FactCheck.org. 18 Dec 2012. Wintemute, Garen. Director of the Violence Prevention Research Program, University of California-Davis. Phone interview with FactCheck.org. 18 Dec 2012. Robertson, Lori. “Violent Crimes and Handgun Ownership.” FactCheck.org. 6 Mar 2008. Face the Nation. Transcript. CBS News. 16 Dec 2012. “Facts: Gun Violence.” Brady Campaign to Prevent Gun Violence. Undated, accessed 20 Dec 2012. Fatal Injury Reports, 1999-2010. National Center for Injury Prevention and Control. Undated accessed 20 Dec 2012. Injury Mortality Reports, 1981-1998. National Center for Injury Prevention and Control. Undated accessed 20 Dec 2012. Murder Victim, by Weapon. 2011 Uniform Crime Report. FBI. Undated, accessed 20 Dec 2012. Definitions for WISQARS Fatal. National Center for Injury Prevention and Control. Undated accessed 20 Dec 2012. Murder Victim, by Weapon. 2006 Uniform Crime Report. FBI. Undated, accessed 20 Dec 2012. Table 15. Crime Trends: Additional Information About Selected Offenses. 2007 Uniform Crime Report. FBI. Undated, accessed 20 Dec 2012. Table 15. Crime Trends: Additional Information About Selected Offenses. 2009 Uniform Crime Report. FBI. Undated, accessed 20 Dec 2012. Table 15. Crime Trends: Additional Information About Selected Offenses. 2011 Uniform Crime Report. FBI. Undated, accessed 20 Dec 2012. Nonfatal Injury Reports, 1999-2011. National Center for Injury Prevention and Control. Undated accessed 20 Dec 2012. Nonfatal firearm-related violent crimes, 1993-2009. Bureau of Justice Statistics. Department of Justice. Undated, accessed 20 Dec 2012. This Week with George Stephanopoulos. Transcript. ABC News. 16 Dec 2012. “Major School Shootings in the United States Since 1997.” Brady Campaign to Prevent Gun Violence. Undated, accessed 20 Dec 2012.